Each year the children of fourth class are lucky to be able to receive guitar lessons for a six period. These lessons are delivered by Don Nea who works closely with the children in small groups. The children each get a guitar to practice on and start from the beginning learning the key chords and the correct way to strum. As the six weeks progress, the children learn simple songs, sing along and use percussion instruments to aid their playing. At the end of the six weeks, the children have a repertoire of songs and chords and put together a performance. The parents of the performers are invited to join as are some of the other students in the school. 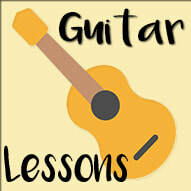 The children are very lucky to receive these guitar lessons, courtesy of the PTA and receive a great foundation in guitar playing that can be enhanced as they grow older.